Everybody wants to Make Money Online, and nowadays the best way to earn money online is create a blog and earn a lot of money by showing adds and do some affiliate marketing and much more way to get some money from your blog. But to make a blog you have to by a TOP LEVEL DOMAIN like yourname.com or yourname.org yourname.net etc somthing like that, but in 20's century peoples don't wants to invest to earn money from their blog. 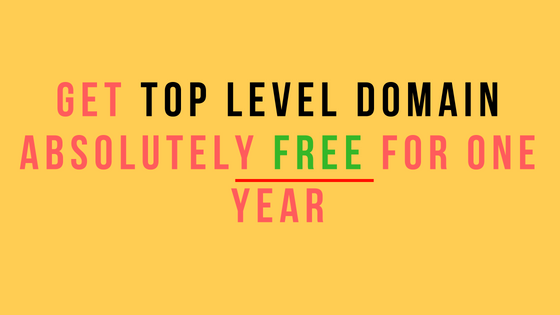 They just want free thing where they can earn 100 dollars per hour something like that, so we are found the way to get a top level domain for free. Top Level Domain is the last segment of domain name authority. Top level domains are classified into two categories, One is generic top level domain ( for an example .com .org etc) and other one is Countrywise Top Level Domain like .in, .co.in, .co.uk etc. then click search it will show some bulk domain infront of you, Just choose as per your need. Remember one this you won't get the premium domains for free. Now the final touch up, you just use the Coupon Code "getooo" then the price of 1699.00 Rupees will be zero. Remember the registration fees will be free for one year. Now you can host your domain on free hosting or blogger. But Our recommendations is use Hostinger , they provide cheaper plan for new blogger. And your website will be secure and always live and if any problem you face in future their helping service is to good.